Medicaid expansion in Virginia is in effect! The Regional Primary Care Coalition represents a cross-jurisdictional effort to improve the health of people living in the National Capital Region*. The District of Columbia and surrounding counties in suburban Maryland and Northern Virginia share not only borders and proximity to the federal government but transportation systems, highways, waterways, parks and recreational facilities and one of the most racially and ethnically diverse populations in the country. Although residents may call Virginia, Maryland or the District home, the borders are porous. People travel across the region daily for work, worship, recreation, shopping, entertainment and social activities. The region also shares relative wealth, prosperity and opportunity compared with much of the country. These advantages are not uniformly enjoyed by everyone or reflected in health and quality of life. There are significant disparities in income, educational and employment opportunity, and access to quality health care and housing in communities in each jurisdiction. These underlying conditions have contributed to poor health indicators in some communities, including a 10-year difference in life expectancy depending where in the region one lives. The Regional Primary Care Coalition offers a regional perspective on health and health disparities. We support strategies to address health disparities and promote activities that advance health equity within the National Capital Region. 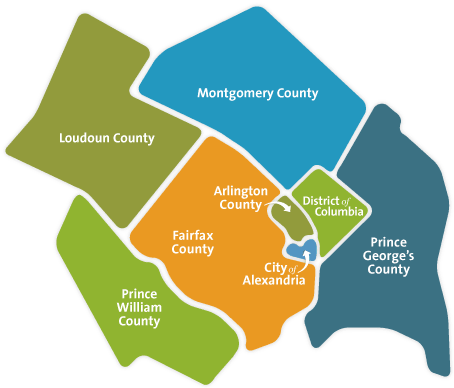 *includes the District of Columbia, Montgomery and Prince George’s Counties in Maryland and Arlington, Fairfax, Loudoun, and Prince William Counties and the City of Alexandria in Virginia (Manassas City, Manassas Park City, Fairfax City and Falls Church City are independent jurisdictions included in these Northern Virginia County health districts). The Regional Primary Care Coalition (RPCC) is an active collaboration and learning community of local philanthropies and non-profit primary health care organizations serving Washington, D.C., Northern Virginia, and Suburban Maryland. Concerned with improving the health of all residents throughout the region, RPCC is committed to achieving health equity by eliminating health disparities resulting from systemic and socio-economic injustice. RPCC convenes local leaders and builds regional partnerships to promote policies and practices that improve health and promote equity. RPCC envisions a future in which the health of people living in the National Capital area is among the best in the nation and where health equity exists for all of the region’s residents through timely access to the highest quality health services and the means and opportunity to live well and thrive. Government, businesses and nonprofit organizations work together with communities to create safe and stable neighborhoods, address socioeconomic inequities and establish a continuum of health and wellness priorities and services that meet the needs of all residents. Local policies and priorities often impact neighboring jurisdictions. RPCC believes that there is much to be learned by sharing information about local approaches to population health and health care, and leveraging the lessons learned in one jurisdiction for the benefit of the entire region. RPPC engages in regional efforts to address health disparities and promote health equity. The mission of the Regional Primary Care Coalition is to catalyze regional collaboration to improve population health and advance health equity throughout the National Capital region by ensuring access to integrated health and wellness services that address underlying causes of health disparities and improve quality of life. We do our work by sharing information, undertaking collaborative projects, and using our collective knowledge about health care and population health to inform policies and practices throughout our region. Improve health and wellness services by sharing data, knowledge, promising practices, and innovations among the region’s health care providers, policy makers, funders and consumer advocates. Leverage knowledge and resources to speed the development, adaptation and replication of effective approaches to improving health and well-being by undertaking collaborative projects across the region. Advocate for policies and practices that improve the health status of communities to advance health equity; facilitate innovation in the design, financing, and delivery of health and wellness services; and increase the availability and sustainability of integrated systems of community-based care.